She was a great star of the 1930s and early 40s who knew when to retire and stay out of the limelight. And no, she wasn’t entirely French. Carroll was born in 1906 in Staffordshire in England’s West Midlands, northwest of Birmingham. Her father was a visiting professor of Irish extraction; her mother was French. And, they produced a visual knockout. Carroll was gorgeous opposite Ronald Colman in 1937’s Prisoner of Zenda (see photo above). And she looks pretty good in the photo below. 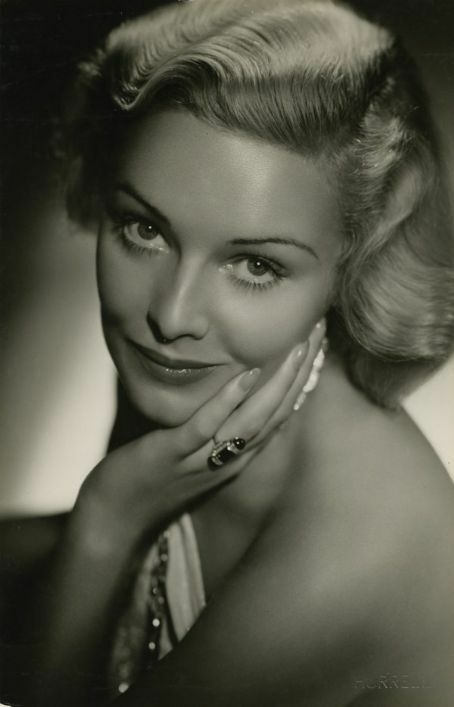 Author-critic David Thomson put it nicely: The first English rose transplanted to America, Madeleine Carroll had all the regal beauty of the English leading lady. Offscreen Carroll led an active personal and avocational life. Her four husbands were an unusual assortment — a soldier, actor, a movie type and a powerful publishing mogul. Carroll’s courageous efforts to support the Allied cause in Europe in World War II won her a Legion d’Honneur citation from the French government. A woman of fine intelligence, she had strong beliefs and acted upon them. 1) Question: Carroll is perhaps best remembered for literally being handcuffed to which one of the following actors in this signature Hitchcock’s thriller. a) John Gielgud; b) Robert Donat; c) Peter Lorre; or d) Robert Young. 2) Question: By the mid-1930’s, Carroll was deeply frustrated because she was making bigger and bigger pictures but being paid less and less. a) True; or b) False. 3) Question: Carroll interrupted her movie career in the early Forties because a) Her pictures bombed at the box office; b) She tired of Hollywood and the tedium of movie-making; c) She decided to take up nursing for the Red Cross during World War II; or d) The studios refused to pay her more. 4) Question: Carroll’s second husband was a 6-foot-5 actor born in New Jersey as John Hamilton. Who is this big fella? a) Gregory Peck; b) Rock Hudson; c) Sterling Hayden; or d) Guy Madison. 5) Question: With her career on the wane, Carroll actually found herself playing opposite Bob Hope and a roller-skating penguin in a wacky and eminently forgettable comedy. a) True; or b) False. Our New Series — Classic BIG BANDS (and Mickey Rooney Too). With four failed marriages, MADELEINE CARROLL on screen appeared to be so gentle and loving, but like so many movie stars never found that in her personal life.